1.44 p.m. R3 2 Reliable Lad (4 g Reliable Man – Fiorenza, by Stravinsky) – Jake Bayliss; has been given time (32 days) since being checked rounding the home turn and in the straight at Te Rapa, following a good third at Tauranga. Beaten by a neck at his only course attempt, over 1400 metres, he could bounce back from barrier six in the $10,000 Maiden 1600 metres. Fixed odds: $6.20 & $2.30. 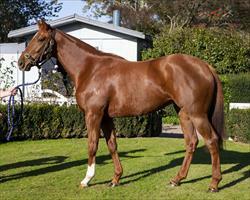 4.04 p.m. R7 13 Recension (3 f Dalghar – Rave Review, by Royal Academy) – Jake Bayliss; ran a very good third on debut in the 2YO 900 metres on 30 June at Ruakaka, but came undone after running hard in front on 22 August in the Maiden 3YO 1100 metres at Taupo. Back right-handed and handily drawn in barrier five for the $10,000 Maiden Fillies & Mares 1150 metres, she has the ability to turn things around. Fixed odds: $11.50 & $3.60.